Credits: USAF/Boeing. Thanks to Leonard David for providing photo. 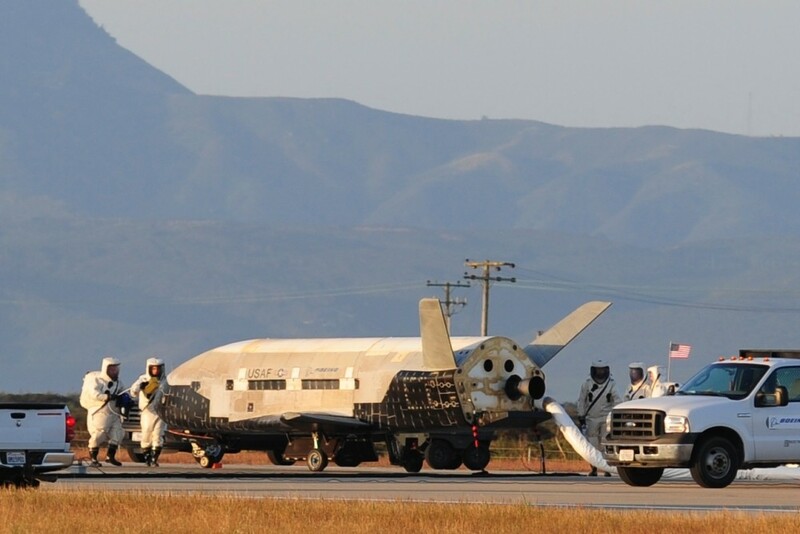 Emerging from the shadow of Shenzhou-9’s triumphant launch, the USAF X-37B designated Orbital Test Vehicle (OTV)-2 returned to Earth on Saturday, June 16th after 468 days 13 hours and 2 minutes on a voyage that orbited the Earth more than 7,000 times performing a classified mission. OTV-2 received the command from its ground controller to return and initiated an autonomous firing sequence of its propulsion system to brake from its orbit and dive through the atmosphere for a reentry over the Pacific Ocean. 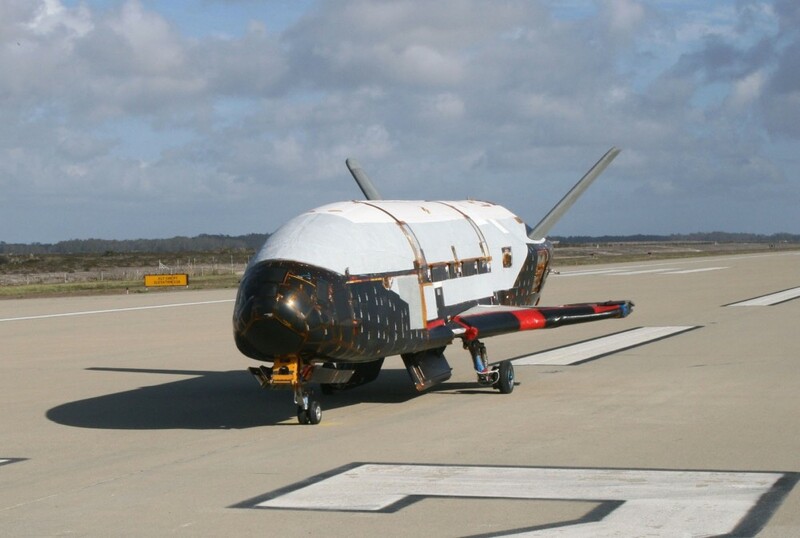 OTV-2 executed a series of turns similar to those performed by the Space Shuttle to dissipate speed as it navigated autonomously via GPS towards Vandenberg AFB in California. OTV-2 touched down on the 3-mile (4.8 kilometer) long runway at Vandenberg 5:48 a.m. local (8:48 a.m. EDT; 1248 GMT). OTV-2’s flight and that of its sister ship OTV-1, is classified and will likely remain so. It is that secrecy that has spawned speculation about the purpose of the both spacecraft ranging from a test-bed for new sensors and materials to being a prototype for a new generation of space weapons. OTV-2 in particular created a stir when one of it orbits brought it near the orbit of China’s Tiangong-1 space module. Speculation arose that OTV-2 was maneuvering within range of the module to take clandestine photographs. There is little evidence to support this assertion, but at the same time there is no direct contradiction from the Air Force either. 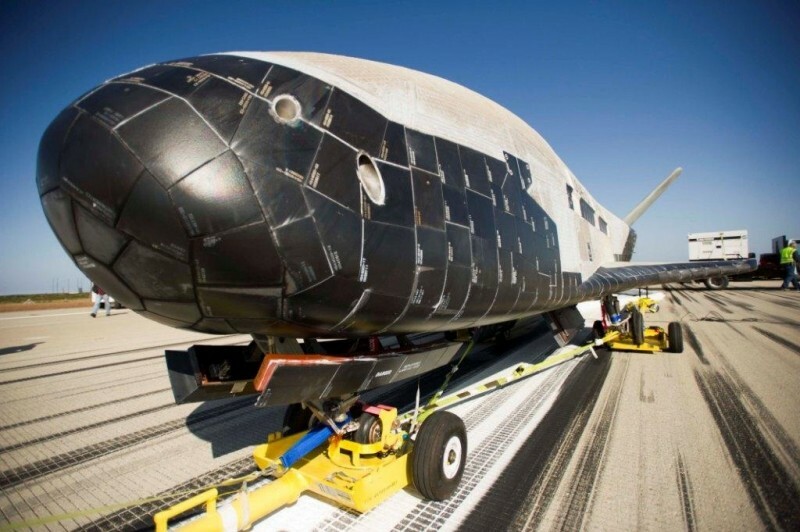 The U.S. Air Force maintains that both spacecraft are designed as test-beds for new technologies; however, the classified nature of the project will ensure that speculation will continue to abound regarding the X-37B, no less than its mysterious if not apocryphal derivative, the crew-and-cargo-carrying X-37C. While the suppositions surrounding the true mission of OTV-2 will continue regardless of evidence or public statements by the U.S. Air Force, the timing of the return of OTV-2 does bring into question whether it was intended to coincide with the launch of China’s third manned space mission and prior to that mission’s scheduled rendezvous and docking with Tiangong-1. The Shenzhou-9 mission has garnered wide interest even more so with a public broadcast of the launch. China recognizes the geopolitical significance of this flight and the interest that it will continue to generate in spacefaring and non-spacefaring nations alike. The June 16th landing of OTV-2, which has garnered its own worldwide attention and interest, on the same day that China launched Shenzhou-9 may have been deliberately designed to take some of the attention away from the Chinese mission. There has been no confirmation that this is the case, but undoubtedly U.S. officials recognized the potential opportunity to take some attention away from the Chinese space program and show that the United States is still a major player in outer space activities. Whether this was the intention or not, OTV-2 did succeed in holding the attention of the world. Now that OTV-2 has returned to Earth, it will roll back into the shadows of secrecy while the spotlight focuses once more on China and its first ever manned rendezvous and docking in orbit.